Steve Jobs Movie 2015, first trailer arrives ! Apple, a brand personified by the Man, indeed Steve Jobs ! Well up from music industry, telecommunications industry(hacking), animation industry all the way upto computer industry, Steve Jobs was better known for his miraculously beautiful, famous presentations. He and Steve Wozniak developed the first modern computer that revolutionized the entire computer industry, well quite a few know that the pair had previously started up with an telephone which use to hack router codes, used for fooling the entire telephone system to make free calls all over ! In 2007 ,introduction of the iPhone stepped up the game for Apple and changed the entire mobile phone industry ! IPhone, a device that comes with no manuals and everybody knows how to use it ! Amazing... !?! #stevejobs . Well iPhone was then followed up by the introduction of iPad in 2010 introduction of first ever tablet, a completely new device category ! He's way of presenting anything at the launch keynote was awesome, he used to make everyone laugh, chuckle and used to create friendly environment around, well words would-be less to describe it ! Speaking about the Jobs movie in 2013 were Ashton kutcher played the role as steve jobs didn't took it quite well. 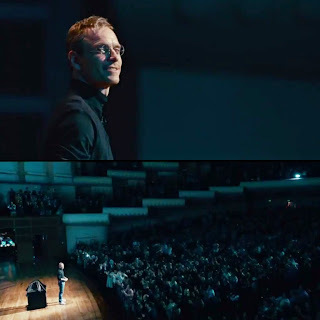 Just Today a new video dropped on YouTube regarding the newest film : Steve Jobs, where Michael Fassbender is playing as jobs, well after watching that teaser trailer, my nerves are pretty much raised up, i am totally thrilled and excited about the new, Steve Jobs Movie on October 9,2015. Trailer however reveals few inspiring words spoked probably between Steve Wozniak and Jobs ! "You can't write a code, you're not an engineer, what do you do ? ", says Steve Wozniak. Steve Jobs replies " The musician's play the instruments, i play orchestra ! I sat in the garage and invented the future, because artists lead and hacks ask for show of hands ! " The end scene shown in the teaser shows us that it might be scene of unveiling of the first iMac from 1998. Steve Jobs is directed by Danny Boyle and written by Aaron Sorkin, working from Walter Isaacson’s best-selling biography of the Apple founder. The trailer also gives us our first glimpse of Jeff Daniels as early Apple CEO, John Sculley and Kate Winslet as Apple marketing chief Joanna Hoffman and Seth Rogen as Steve Wozniak. Let's hope this movie is a blockbuster hit, just like the social network movie.